Mark Easterbrook goes to see his writer friend, Mrs Oliver, to ask her to open a church fête. Mrs Oliver “in a state apparently bordering on insanity, was prowling around the room, muttering to herself . . . 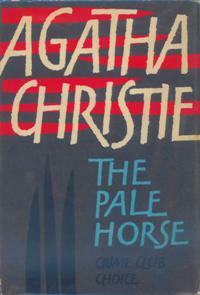 Feeling in need of comfort reading the other evening, I chose an Agatha Christie that I hadn’t read for a while. It’s definitely one of my favourites among her later novels: a feisty heroine, a wonderfully creepy atmosphere, superlative plotting – and it’s funny too. One of the things I so much like about Christie is her ability to laugh at herself. That’s always engaging. For Mrs Ariadne Oliver (brilliant name!) is a thinly disguised version of Agatha Christie (with a tiresome Finn instead of a Belgian as her fictional detective). And what amused me so much is that Mrs Oliver’s struggle to make her plot work is all too familiar to us lesser mortals toiling in the field of crime fiction. By the end of Mark’s visit he has quite by accident happened to make a remark that offers Mrs Oliver a solution to her problem. And VERY SMALL SPOILER ALERT, she in her turn has shed light on the plot of the novel. It’s beautifully done. Chapeau, Dame Agatha! There is no-one quite like you. This really is a good ‘un, isn’t it? I think what I like about it is that Christie shows that she can create a sense of foreboding and atmosphere. She doesn’t do that in all of her books; it’s good to remember that she had the skill. Good to hear from you. Yes, I like that about it, too. The shiver up the spine . . . I also get the impression that though she took her writing very seriously, she didn’t take herself seriously, and that is always attractive. I’ve never thought of this as one of my favourite Christies (though moderate Christie is better than most people’s best…) but now of course you have made me want to re-read it. Murder, violence, wickedness and hatred – what could make for a better comfort read… ? Yes, indeed! What’s not to like, Moira? I enjoyed rereading and although I remembered how the murders were committed, I had forgotten who the villain was. Also liked Mrs Dane Calthorp and I always like the dying-words-to-a-priest trope. Oh good. Another one to pick up. I’ve recently been reading some of her lesser known ones, that I’ve read perhaps only once in the past. I’d forgotten Mrs. Oliver was in this, so a double treat in store for me. I’m currently rereading her memoir of an archeological dig in Syria, Come Tell Me How You Live, and enjoying it hugely. I have to put myself firmly in the 1930s when it took place. Still, of course, it makes me weep for the people of the present day. I think Agatha Christie is pretty much underrated as a humourous writer. It certainly comes out in this memoir, and in so many of her delightfully drawn characters. Quick follow-up: the memoir has recently been republished, with photos. I may have to track down that copy. I read the memoir about 18 months ago (and blogged about it). I thoroughly enjoyed it, too. I loved her account of trying to buy a suitable outfit and the indignities she suffered! Yes, so sad and heart-breaking to think of what is happening now.